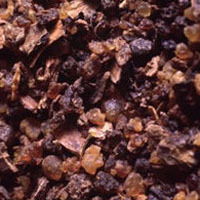 Myrrh grows as a shrub in desert regions, particularly in northeastern Africa and the Middle East. The resin obtained from the stems is used in medicinal preparations. In one trial, 98% of people with schistosomiasis (a parasitic infection) who were treated with a combination of resin and volatile oil of myrrh were cured of the infection. Myrrh is a traditional remedy with wound-healing properties that has a long history of use for mouth and gum irritations. In traditional herbal medicine, tinctures of various herbs including myrrh have been applied topically to herpes outbreaks in order to promote healing. The resin of the herb myrrh has been shown to kill various microbes and to stimulate macrophages (a type of white blood cell). Volatile oils made from myrrh have antibacterial properties and may be effective in mouthwash or toothpaste form. Myrrh is an anti-inflammatory and soothing herb that may be effective in the treatment of ulcerative colitis. In ancient times, the red-brown resin of myrrh was used to preserve mummies. It was also used as a remedy for numerous infections, including leprosy and syphilis. Myrrh was also recommended by herbalists for relief from bad breath and for dental conditions.1 In Traditional Chinese Medicine, it has been used to treat bleeding disorders and wounds.